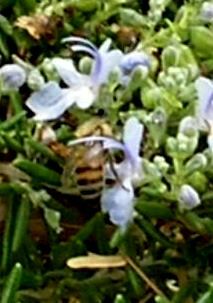 This picture of a bee visiting a rosemary bush was taken last week in my front yard. You’ve probably seen a photo like this before on a greeting card, calendar or inspirational poster. It may conjure images of warm, lazy days. Or perhaps you see the bee as a symbol of the promise of spring or Faith and Hope. The fact is the honeybee and its fellow pollinators need more than hope right now. For over a decade scientists have been discussing the decline of pollinators. The losses of habitat, use of pesticides, and other stresses have created a marked decline in population. It has been stated that in the United States we have lost over one-third of the honey bee hives, which is over 1,800,000 colonies. This is a costly problem for crop owners and manufacturers of numerous goods who have resorted to shipping farmed bees to new locations. Costly in shipping; costly for the bees. Shipped bees, both honeybee and bumblebee, are not acclimated to the new surroundings and can become sick. The remaining local bees can be ousted by the new arrivals. Meanwhile the underlying issues are not addressed and the problem escalates. You might be asking “why should I care?” The next question is “what can I do?” As for the question of “why exactly this is happening”…that is too large a topic for this blog but I will direct you to other sources. At least one-third of our food as humans depends on the pollination by bees; not only fruits and vegetables but the grasses which feed the cattle. In fact, twenty-five percent of all animal life depends on plants pollinated by bees. In addition to the food crops bees are necessary pollinators for crops used in textiles, edible and essential oils, plants used in the formulations of medicine and other products which utilize the wax. Let us also not forget the simple things like that bouquet of roses for your loved one or the wildflowers beckoning you to a scenic drive. The best action you can take is to limit your use of pesticides and herbicides. Chemicals toxic to pests are also toxic to pollinators. In the case of social bees these toxins are carried into the hive where they affect other bees, but the larvae still have a chance. For solitary bees the resulting loss of egg laying females affects the numbers more dramatically. A light soap solution or organic deterrent such as plant oils is usually all that is needed for minor pest problems. Better yet, consider companion planting to encourage natural predators such as lacewings, birds and frogs. Add native plants to your landscaping. Bees need a variety of plants to supply all the necessary nutrients. A limited diet equals a reduced immune system. A great perk to this is that native plants often require little to no maintenance and add texture and color to your garden. Become a Bee Guardian or even a beekeeping hobbyist. A bee guardian simply creates a space for bees to flourish. A beekeeper manages hives and reaps the benefit of harvesting honey. Speak up. Encourage biological diversity in your neighborhood and encourage government agencies to create policies based on sustainability. The Xerces Society is a non-profit organization that protects wildlife through the conservation of invertebrates and their habitat. Their website is a plethora of information including scientific updates, endangered species listings and conservation tips. The Ecological Society of America offers case studies, resource listing, policy overviews and more. This website has links too numerous to mention and is well worth the visit. The Lady Bird Johnson Wildflower Center is a good place to begin your search for native plants. Natural Areas Journal [Nat. Areas J.]. Vol. 21, no. 1, pp. 78-88. Jan 2001. Science Direct, a database of scientific literature, has an issue on bees.